To a sports fan, journalist Rafi Kohan has what could be seen as a dream job. He spent a year visiting America’s biggest, brightest, most bedazzling sports stadiums, from the over-the-top AT&T Stadium where the Dallas Cowboys play to the nostalgic Fenway Park in Boston. But it wasn’t all fun and games for Kohan. 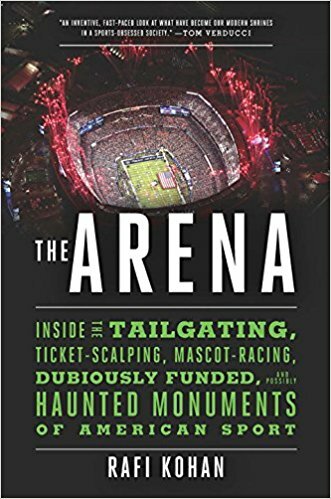 His travels and interviews were research for his new book, The Arena: Inside the Tailgating, Ticket-Scalping, Mascot-Racing, Dubiously Funded and Possibly Haunted Monuments of American Sport. Kohan spoke about his book, which takes an insightful look at the big business of marketing big games, on the Knowledge@Wharton radio show, which airs on SiriusXM channel 111. Following is an edited transcript of the conversation. Knowledge@Wharton: You spent a year going to sports stadiums. How do you best describe that time? Rafi Kohan: Fun but exhausting. Going to a game is always great. It’s always great to go out to a ballpark, but it can take a toll as well. All my friends would say, “Man, I’m so jealous of you.” And I would say, “I’m so jealous that you get to not go to a game today.” But I would never complain. It was truly the experience of a lifetime to get to hit the road for a year and explore stadiums and the underworlds of stadiums in a way that I had always been curious about, but I never had the opportunity to learn as much as I wanted to. Knowledge@Wharton: What are the seminal points that maybe you didn’t think of when you went into this project? Kohan: There are a few because I tried to cover a broad spectrum of topics within the book. I went into this project thinking I’m going to get to see a lot of sports, a lot of baseball, a lot of football, a lot of basketball being played. One of the things that was surprising to me was to what extent each of these sort of underworlds were so fully realized in and of themselves, whether it was ticket scalping or grounds-keeping or fan entertainment or food services and operations. There’s so much to each of these elements that those games kind of fade away. You almost forget that they’re happening. They’re just a backdrop. I spent more time looking away from the field of play than I did looking at the field of play. One of my other big takeaways, which is a slight tweak on the economic argument, is that having spent as much time as I did looking into the literature and talking to sports and stadium economists, the consensus is that all of the evidence suggests that there’s not an economic benefit to building a stadium. They’re not good economic drivers. Of course, they can create targeted economic activity within specific areas. But as a whole, macroscopically, when you pull out region wide, they’re not a benefit and that’s really not an argument we should be buying. Knowledge@Wharton: One of the main reasons why stadiums seem to get built is because the team or the owner of the team holds the city hostage, to a degree. They threaten to leave the city, and the city or the state ends up caving in the end. Kohan: I don’t mean to exaggerate, but it’s almost a kind of emotional manipulation. Think about our attachment to these places, our attachment to these teams. It goes so much deeper than just the fact that we’re building a new stadium and tearing down another one, although that goes pretty deep as well. But yes, absolutely. These leagues hold monopoly power because there’s a finite amount of supply and seemingly infinite demand between both large and mid-sized cities around the country clamoring for teams. Often, and hopefully less often, cities are willing to fork over inordinate sums of taxpayer money without necessarily understanding the full consequences of their actions to draw a team. That’s how it really started. In 1953, Milwaukee had built this stadium and drew the Braves from Boston. That’s the first thing that kicked off this relocation trend that’s been in America for the last 50-plus years. Knowledge@Wharton: We’ve reached the point where the game itself is part of the attraction. It used to be the only attraction. When Milwaukee built County Stadium and they got the Braves to come there, it was fantastic. They put concession stands in. They had to put bathrooms in. But that was it. Now it’s full-service entertainment where stadiums have to have all kinds of different entertainment pieces, whether it be for adults or kids, because kids will not sit for three hours and watch a baseball game or a football game. Kohan: Absolutely. One of the major trends right now is this idea of segmented experiences or neighborhoods within a stadium. We’re still going for this communal experience, right? It’s one of the last places where we go to be with other people and experience a live event. But at the same time, it’s much more splintered than it ever was and for exactly the reasons you’re saying. You go to a ballpark and you have the kid zone out in the outfield and you have the luxury club behind the home plate and then some other suites in another area and the tequila bar over here and the standing-room-only bar for the young professionals on that side. It’s all about trying to hit these very targeted markets. For football, the idea is providing all this extra ornamentation and pizzazz because it’s hard to convince people to go to a football game when you’ve got to fight through traffic and the ticket prices can be prohibitive. Football is a product that’s designed for TV, so it’s hard to get people to come out. People are working hard to try and figure out how to keep those turnstiles turning. Kohan: Absolutely. There’s a quote that I heard pretty often, which was, “Oh, something is minor league-ish,” or “Oh, that’s too minor league.” For a chapter that I wrote in about fan entertainment, I spent time with the Kansas City Royals. They have a guy named Don Costante (senior director of event presentation and production) who came from the San Antonio Spurs of the NBA. A decade ago when he came over, game presentation was at such a different level for the NBA and inside of arenas than it was at ballparks. A decade ago, the Royals hadn’t been to a world series, they weren’t playoff contenders, forget about even the wild card chase. For them, they wanted to amp up the fun. They wanted to recreate that NBA atmosphere inside the ballpark. Costante was tasked with doing that and was sort of given carte blanche to do whatever he wanted. But, you know, 2014 rolls around and the team goes on this unexpected run into the playoffs, into the World Series. Then in 2015, the year I spent with them, they actually make it to the World Series and win. Then suddenly there’s these murmurings from the front office that say, “You know what, why do we have to have all these crazy promotions and gags and games within the game? Why can’t we just focus on baseball? Why can’t it just be about winning?” That’s really the conflict that always happens: winning versus fun. That’s something that they don’t have in the minor leagues. Teams like the St. Paul Saints are pioneers when it comes to the crazy gags and the giveaways. Knowledge@Wharton: The Veeck family. They are very well known. Kohan: That’s right. Mike Veeck, son of Bill, the great Bill Veeck, the P.T. Barnum of baseball. I spoke to [St. Paul Saints Baseball Club vice-president] Tom Whaley. He doesn’t love this distinction because he worked for a time when Mike Veeck went to the Tampa Bay Rays and was sort of met again with that attitude of, “That’s a little bit minor league-ish. We don’t do that around here.” He said that for billionaire owners who are presumably so smart in so many other aspects of life, they’re so dumb when it comes to this idea of promotions at the ballpark because it doesn’t have to be a distinction between winning and fun. As you said, so many of these promotions and ideas, like running the bases and heritage theme nights and between-inning gags, they absolutely all started in the minor leagues. It’s because there was a desperate owner trying to draw a couple hundred more fans. So, there’s a trickle up effect. But it’s always kind of changing, that definition of what’s major league, what’s minor league. It’s very fluid. Very interesting. Knowledge@Wharton: You talked to ticket scalpers. I wanted to get your reaction to their piece in this equation. You can’t go to any major league stadium — baseball, football, NBA, whatever it is — and not see scalpers outside trying to hawk tickets before a game. Kohan: That’s certainly always been true, and it will be interesting to see if that remains true. To me, scalpers were always this very intriguing element of the game day experience. They exist on the margins, this external ecosystem, this street level entrepreneurship that happens on the day of the game. It’s almost like the stock market, just buying and selling. What they call grinding — buy a ticket, sell a ticket, buy a ticket, sell a ticket, just constant motion. But it always seemed a little illicit to me. I don’t know if it was scary, but it had an edge to it. That was one area in particular that I knew I wanted to learn more about because it just seemed so interesting. Who were these guys? How did they get into it? How did they do it? I spent time both around Fenway Park in Boston and then up in the Gateway District in Cleveland, which is where the Cleveland Indians play in Progressive Field and the Cavaliers play at Quicken Loans Arena. I went up there for a couple weeks and I basically pestered my way into their inner circle. The first few guys I approached with a notebook and a couple questions, perhaps smartly just turned their back on me and walked away. But eventually I was welcomed in and really got an inside look at who these guys were, how they got into it, and there’s a wide range of reasons. There’s a reason that this is a margin economy. Some of these guys might have records. They might have habits of some kind. Perhaps they just fell into this lifestyle 25, 30 years ago when ticket scalping was in much more of a halcyon days, when it was easier to buy and sell tickets before things like StubHub and digital ticket markets came online. Suddenly, you don’t have a resume. You don’t have references, and you can’t do anything else. This is who you are. This is what you do. It was really fascinating because there’s not only this level of entrepreneurship to it…. It’s not just, we show up at the game today and we’re going to buy a ticket and try and sell it. It’s also tomorrow when there’s not a game, maybe we’re going to go on a road trip to Vegas and stake out a boxing match. Or we’re going to travel around the country following Taylor Swift on her tour. Or go to the southeast for college bowl season. There was so much more to it than I ever expected. Knowledge@Wharton: You also spent a good bit of time at the Dallas Cowboys stadium in Arlington, Texas. That is either seen as the most gaudy stadium in the history of sports or the most spectacular, depending on whether you’re a Cowboys fan or not. What’s your reaction to that facility and how they run their operations? Kohan: Can I check the box that’s all of the above? It really is just an over-the-top, gaudy stadium in that truly Texas sense of “bigger is better.” It’s just sort of like the Dallas wealthy class sensibility of you show your wealth. It’s not considered tacky perhaps in the same way that it might be in other communities, but it is also truly a spectacle. That stadium is an icon, and it has earned [that status] already in its brief time in existence because that team and that family put real thought into what they were building in a way that other stadiums don’t. This was an organization that considered everything down to the marble tiles and the elevator buttons and where they were sourcing the materials for these little details. Everything, in the words of [team owner] Jerry Jones, had to scream Cowboys. Everything had to be a reflection of the Cowboys brand and everything that it represents. This is reflected in game day not just in terms of being there for the spectacle, which was maybe the most fun I had had at any stadium. I mean, there were some close seconds, Lambeau Field was a close second and some other ones were a close second, but I think it’s largely because everyone goes to the Cowboys stadium to have fun. They go there because they know it’s a spectacle, because they know it’s meant to be an over-the-top experience, where every tailgate had its own amateur DJ. There was a post-game concert thrown by the Cowboys. Forget the fact that they lost the game. Nobody was thinking about that anymore. There was just so much effort put into everyone having a good time and it being a memorable experience. Knowledge@Wharton: That fanfare makes it a bit more palatable to be paying some of the prices that they’re paying at some of these games right now. Kohan: Absolutely. I think that’s something that maybe other stadiums will struggle with because it’s tough to duplicate. Who can duplicate what Jerry Jones has done down there? He’s a unique salesman in a lot of ways. He’s creatively pretty genius in terms of the way he markets the team, even the fact that they’ve kept their merchandising rights. They’re the only NFL team to do so, and they’re cashing in on it big time. But Jerry Jones has figured out how to draw people to the stadium, not just on the day of the game but on nongame days. People by the thousands come to pay $25 to take a tour of the stadium. You walk around, you see the suites, you see the locker room, and then they deposit you on the playing field and you get to spend as much time there as you want. You can lie down on the midfield star. You can throw a football with your dad or your daughter or whomever you’re with. A Cowboy staffer told me that some people even bring along undercover officiants and they get married on the playing field after tours. It’s sort of like an undercover ceremony. What that seeks to accomplish is it basically creates this emotional connection. Yeah, you’re paying $25 and everything is sponsored. The toilet paper is brought to you by some company, but it’s commoditizing this emotional connection. The emotional connection is real. I think I put it in the book this way that it’s a page ripped out of the Disney playbook because they’re commoditizing this emotional connection, too. Jerry Jones does it in a way that I don’t know that other teams or organizations will be able to successfully duplicate. Knowledge@Wharton: It’s the philosophy of the up-sell. The old line is, “Would you like fries with that?” That is what a lot of teams are understanding that they need to do. They need to provide something other than just showing up and watching a game for three hours. Kohan: Right. So the question is, [should that include] having some sort of celebrity chef restaurant or outpost? Is it having some kind of Frankenstein’s monster style concoction of deep fried nachos that you have to try and then regret later? Knowledge@Wharton: Did you look into how the food at stadiums has evolved as well? Kohan: Absolutely. I specifically spent my time going behind the scenes on the operations at Citi Field in New York, which is one of the top food programs in the country and is widely credited with having popularized some of these modern movements within concessions, largely due to a unique arrangement that they have with Aramark. They retain control and have financial skin in the game, and Aramark actually runs the day to day. It’s much different than just sort of skimming a percentage off the top, which is how this usually works. But I did also look at the history going back to the early days of concessions. There is a quote out of a book about a regatta in Poughkeepsie, New York, around the turn of the 20th century. There was a fat man stirring pink lemonade in a bathtub, and that was basically the concessions. It evolved from that to hot dogs to having folding tables and bags of peanuts and then more fitted planks within alcoves and becoming concession stands. At the very beginning, there were three brothers out of Buffalo, New York, who started a service that eventually became known as Sports Service. They had to beg the major league teams to let them in because major league teams didn’t see any sort of revenue opportunity with food. They had no idea. They said, “All right, you’re going to do it and give us a percentage, fine.” Company lore is that at the end of the first season working with the Detroit Tigers, they made so much money they felt bad about it and gave some back to the Tigers. Knowledge@Wharton: Finally, I wanted to get into the feeling that people have for these stadiums. You mentioned how they love their teams. You were at Lambeau Field, which is seen as a shrine. Here in Philadelphia, we have a new baseball stadium and new football stadium, but back in the day we had the old Veterans Stadium. Even though it was kind of a dump, it was our dump. A lot of people have that mindset where they’re talking about their stadiums. Kohan: I think there is something to the idea of physical spaces in general taking on meaning, especially in Wrigley Field and Fenway Park, the only two remaining turn-of-the-century ballparks. There’s so much history just trapped in the building. It just wraps itself in the physical structure, the cracks in the concrete. You can’t get it out. That’s something that I spoke about with executives at both those teams. Also, for Lambeau Field and the Green Bay Packers is this idea of the soul of the ballpark. Both of those places and Lambeau have gone through or are currently going through renovation, and they’re sometimes struggling to figure out what is that balance between modernity and history. How do you update it in terms of the necessary creature comforts to get people to still come out to the game, but still feel like it’s the same magical place that they went to with their grandparents, or their grandparents went with their parents? What is it about these places? Is it just the memory? Is it walking into the physical space? Is it the quirks? I think every place has a different answer. But the bottom line is that it’s us, it’s what we bring to it, it’s our memories. And when you knock down a place and you go somewhere new, you start new. You start fresh. You can’t bring those same memories with you. They’re just gone.